I just got this for all the video I plan on taking (getting married and got twins on the way). I’m not a big fan of huge complex electronics so this Sanyo Xacti is the perfect size. 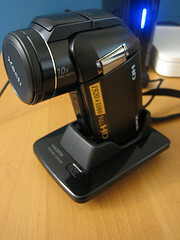 The Sony HDR-TG1 is smaller but cost about $300 bucks more. The Xacti also has more options like adding external flash or mic. The lens on the Sanyo are bigger so more light is captured. I’m sure this helps out big time in darker places. Check out the reviews on Amazon & Steve’s Digicams.